From 2014 to 2016, the number of Israelis visiting the Philippines has doubled. The Ministry of Tourism in Israel expects that number to increase another 30% in 2017. 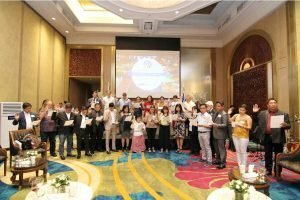 This, according to Itamar Gero, President of the Israeli Chamber of Commerce of the Philippines as he opened the Flavors of Israel Networking Night at the Dusit Thani Hotel in Makati last July 18. 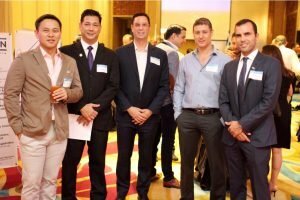 The comments underlined the thriving relationship between Israel and the Philippines and were the foundation for an evening of networking between entrepreneurs, new and old, Israeli and Filipino. The event, which began with Mediterranean cuisine, wine and delightful music from The Manila String Machine and performance by Abel-Meholah Cultural Group, exceeded attendance expectations. Guests were treated to speeches from Itamar Gero as well as Kata Inocencio, VP for Production and Programming at CBN Asia, Israel Ambassador to the Philippines His Excellency Ephraim Ben Matityau, and President of the Philippine Chamber of Commerce & Industry, George T. Barcelon. The audience featured distinguished guests The Secretary of National Defense Delfin Lorenzana, Cory Quirino, TV Host and granddaughter of the 6th President of the Philippines President, Elpidio Quirino, Senator Sonny Angara, Senator Cynthia Villar and heads of other chambers. It was the speech from Ambassador Matityau that set the tone for the evening as he highlighted not only the existing ways that Israelis and Filipinos entrepreneurs are mutually benefiting from 60 years of diplomatic relations but also the untapped opportunities that can provide further collaboration – specifically water technology and cyber security. The Ambassador made a point to promote the ongoing relationship between the defense establishment, an industry that is of increasing importance to both countries given current circumstances. Further highlighting this importance was the presence of Defense Secretary Lorenzana at the event. His Excellency described the Philippines as marching on the road to modernity in technology; a fact that places it and Israel as complementary economies – due in large part to Israel being a country well known as one of the most technologically advanced countries in the world. The Ambassador shared a historical anecdote, one that many Israelis in the audience are familiar with – the creation of Israel as a country and the role that the Philippines played. As the only Asian country and one of only 33 countries that voted for and still recognize Israel, the Filipino vote in 1956 was critical to a successful United Nations General Assembly vote. 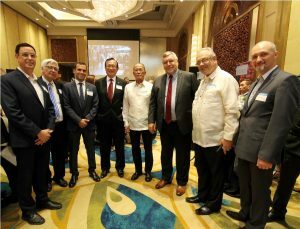 Barcelon went on to pinpoint Israel’s support for the Philippines in agriculture and IT while also mentioning the potential opportunity in the Philippines for Israeli expertise in other IT-related fields, pharmaceuticals and information communication technology. Throughout the evening, the focus was largely concentrated on the great strides that both countries have taken to become reliable partners however, it was clear that both sides needed to do more to realize the vast potential that lies ahead. The night also featured the induction of the 2017-2018 Board of Directors and new members. The Flavors of Israel: ICCP Networking Night is presented by the Israel Chamber of Commerce of the Philippines together with Platinum Sponsor, Dayanan Business Consultancy; Strategic Sponsor, Israel Ministry of Tourism and Event Sponsor, Larry’s Classic Tours. To find out more about membership with the ICCP, visit our membership page.